Why not become a professional ham carver? This elegant jamonero is made of attractive steel and black methacrylate, provides an exceptionally strong hold on the Iberian ham. An essential aspect of determining the quality of a Cinco Jotas ham is assessing the quality of the cut. A good ham stand is important to ensure that the jamón ibérico is properly secured during the carving process. 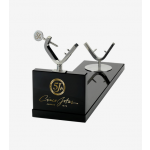 The shape of the Cinco Jotas ham stand is well suited for both the traditional jamón as well as for the shoulder ham (paletilla, in Spanish), providing different support that optimizes the carving conditions for each. 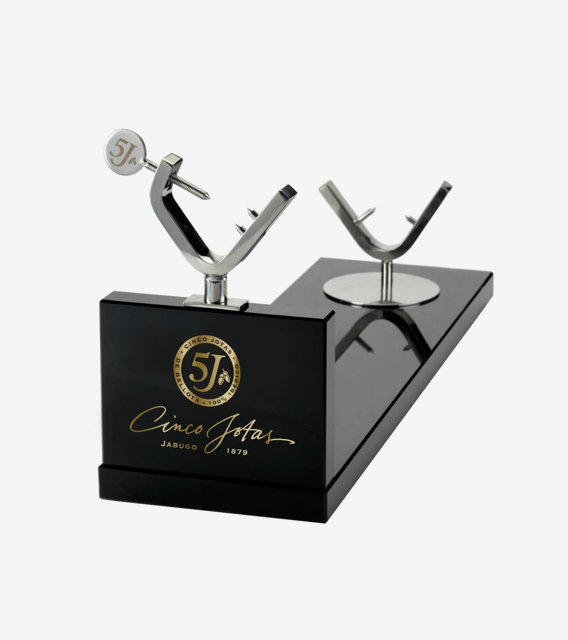 With your very own jamonero you will maximize your culinary pleasure by making the most out of the gourmet experience. You will also delight in knowing that ibérico ham is good for your health! Ibérico ham is cured for several years in the mountains of Spain, enduring the change of seasons when 40% of the fat melts away, bathing the ham in exquisite flavour. The end result is a tender and delicious ham, deep red in color and imbued with a mild, salty flavor that is the delight of any gourmet jamón aficionado. Acorn-fed 100% ibérico ham is known for its multisensory aromas, textures and flavors, but what a true pleasure to know it’s also good for your health. Ibérico breed pigs eat acorns in abundance, a diet rich in oleic acids that contribute to healthy cholesterol levels. The cerdo ibérico roam free range in the dehesas (meadows), developing healthy intramuscular fat that is also good for your body. A healthy pleasure indeed!